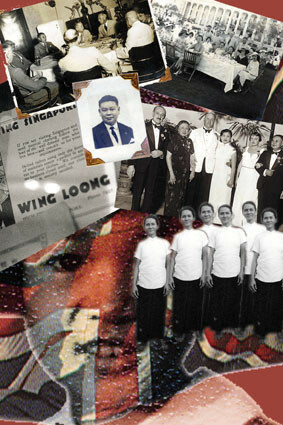 Growing up, English educated, in the former British colonies of Singapore and Malaya in the 50's has given the artist a unique multicultural outlook on life. 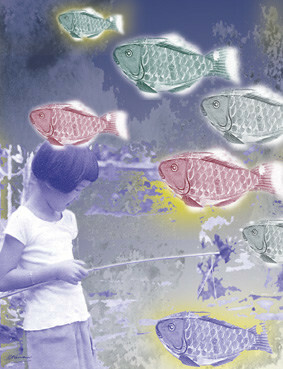 This is a collection of digital collages inspired by that childhood - images from the unconcious. 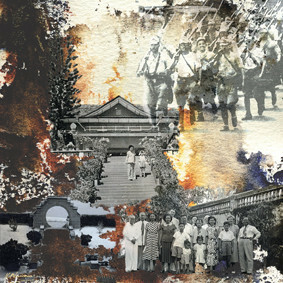 The collages were assembled in the graphics application Photoshop from old photographs, objects and personal art. 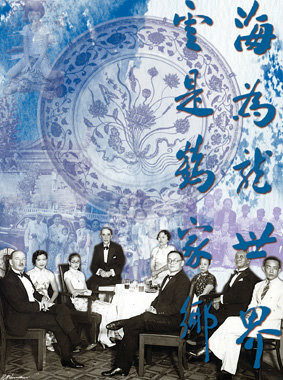 The overseas Chinese including those who emigrated to Malaysia came almost exclusively from the south-eastern provinces of Guangdong, Fujian and Guangxi in China. It has been suggested that emigration was attractive to these southerners because of their superior enterprising nature. Ancestor worship had been a strong force discouraging emigration and those who did leave the country (leaving the graves and spirits of their ancestors without sacrificial offerings) were considered outcasts. The Dutch who were the principal settlers in Malaysia did not attract the Chinese to their colonies and it was only after 1786 when the British began to establish settlements there that the Chinese began to arrive in greater numbers. 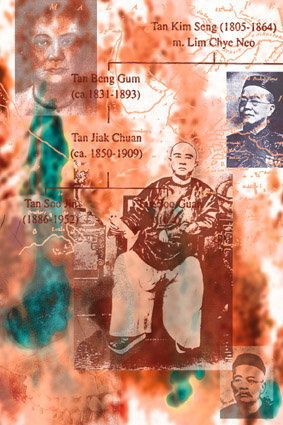 They settled in the Straits Settlements which included Penang and Malacca. 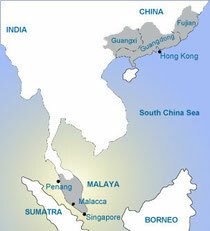 Malacca, which had a trading backgound long before the British arrived, later became eclipsed by the island of Singapore. Discovered in 1819 by Sir Stamford Raffles, Singapore was nothing more than a swampy, thickly jungled island inhabited by a few fishermen and sea gypsies. Situated at a natural cross-roads of international trade, Singapore became the hub of British commercial interests in the region and the nucleus of British military power. The myth of the impregnability of the island was shattered when it fell to the Japanese in 1942. When the Japanese occupation ended in 1945, Singapore became a British Crown Colony. Self government came in 1959 when it became part of the Malayan Federation. Singapore left the Federation in 1965 and became an independent republic. Today the island state with its population of 4 million has the busiest port in the world and is a major commercial and financial centre for Asia. 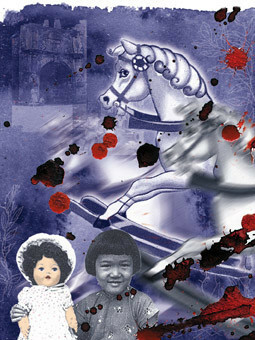 Fifteen collages were displayed at the Palmerston North City Library in March 2001 as part of the exhibition "East Meets West - art and words exploring the east west experience". It was a Palmerston North Festival of Cultures event. At the opening to the exhibition an address was given by Dr. Rosemary Haddon from Massey University, Palmerston North. 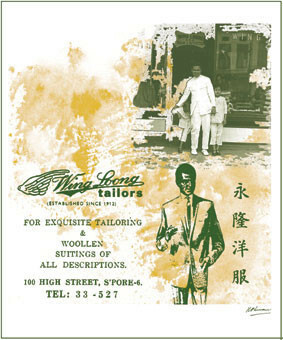 A Singapore Internationale grant from The Singapore International Foundation enabled the (by then further enlarged) collection to be exhibited in "East Meets West" (a juried exhibition, Visual Arts Alberta Association) at the VAAA Gallery front room, Edmonton, Canada in January 2005. "East Meets West - art and words exploring the east west experience". Opening Address by Dr. Rosemary Haddon (Massey University, Palmerston North). The exhibition in the Palmerston North City Library entitled East Meets West is very timely in view of the fact that many New Zealanders are coming into intimate contact with the effects of globalization. One of the effects of globalization is the greater cultural diversity that New Zealand society is now experiencing. I have lived in Palmerston North for six years and, during this time, have noticed how rapidly the town has changed. In particular, it has developed a profile that has become increasingly more multicultural. This profile is both familiar and exciting. It is familiar because it reminds me of what happened in Vancouver, Canada, fifteen years or so ago when that city became a favourite destination for people emigrating from Hong Kong and Taiwan. It is exciting because it is a clear indicator that New Zealand is reaching out and becoming more closely linked with Asia. There is a common feeling shared by many of us in New Zealand that over the last few years this country has been pulled into a global life that is increasingly defined by ethnic and cultural pluralism. While we here reach out to Asia, at the same time one has to wonder what it feels like for people from countries within Asia to come and live among us here. They come to a world that the Indo-American writer Jhumpa Lahiri terms "foreign and at times indifferent." Is the sojourn of these immigrants happy? Or is it marred by conflict or crisis, some of which is generated by the mis-match between European and Asian values. The story of these immigrants is very real. Today it is narrated for us in the form of the art and novels on display here. In reading through the synopses of the novels put together by the librarian Jill Pearcey, I am made aware of the enormous range of cultures, home countries and destination countries described by these writers. The home countries include India, Pakistan, Sri Lanka, China, Japan, Korea and Vietnam to name but a few, while the destination countries include England, the United States, and Australasia. I was reminded, moreover, that what we now call the Asian Diaspora has been going on for some time. 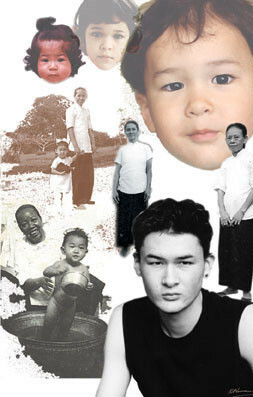 Only recently, however, has the fabric of our European life begun to feel the impact of Asian migration. As a result, our society has become culturally more enriched as these immigrants assume an integral part of mainstream New Zealand life. Another thought that came to my mind as I scanned through the booklist was the reasons for the Diaspora - the causes impelling people to uproot and risk the hazards of a new and sometimes discouraging life abroad. The reasons, it seems, lie with the end of imperial or colonial rule in those countries, the desire to escape various forms of oppression and, more recently, the dynamics of globalization. Whether post-colonial or post-modern, the merging of so many cultures has led to the removal of barriers that, in the past, impeded cultural understanding and that led to stereotyping. These barriers belong to the past now and we are fortunate in being presented at the present time with another chance to get to know each other better. The confluence of east and west is one theme in the exhibition of computer-generated artwork by Kathleen Newman, an artist based here in Palmerston North. 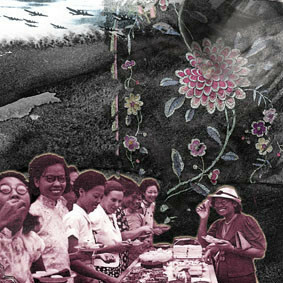 This theme is epitomized by Kathleen's collages and her family background that inspires her art. Kathleen comes from Singapore - a place that has succeeded like nowhere else in merging Westernization with traditional Asian values. 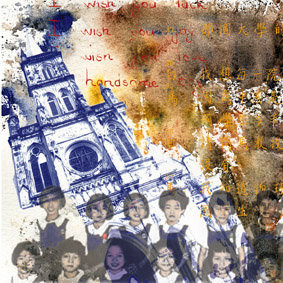 The blend of East and West is put into relief in Kathleen's personal narration attached to each of the collages. 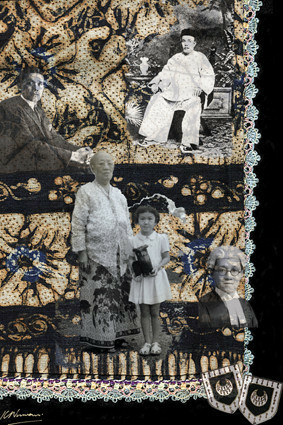 Her narration tells a tale of ancestor worship, the invasion of Singapore by Japan, the society of British civil servants, and the family cooks who, and I quote, "were as adept at cooking Chinese food as roast beef and Yorkshire pudding." 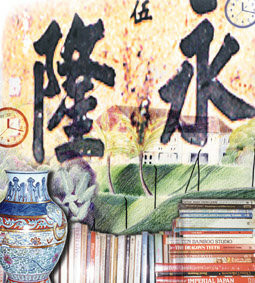 Personal and confessional, Kathleen's narration relates how her parents were educated in English, could not read Chinese and seemed Westernized. 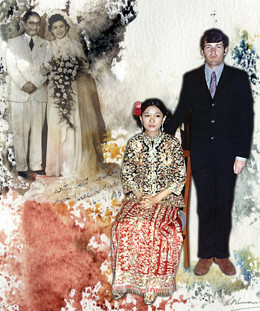 Nonetheless, the family remained a Chinese one and maintained its customs, traditions and dialect. I assume, based on what Kathleen states, that the family's ability to retain its identity provided this artist with valuable emotional and spiritual sustenance that continues to nurture her in her artistic expression today. The mixture of East and West is termed by Jhumpa Lahiri as a "perplexing bicultural universe" that the author inhabits despite growing up in the United States. 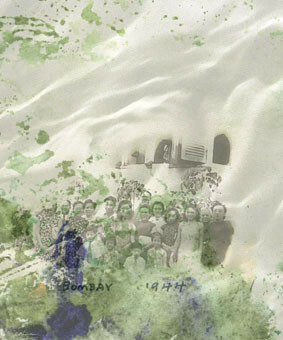 Jhumpa confesses that she writes to forge her own "amalgamated domain" out of the crisis of her parents who struggled to preserve familial and communal traditions in a strange land. Jhumpa describes her writing as "a simultaneous translation, in both directions, of characters who literally dwell in two separate worlds" (Internet). Hyphenated cultures and conficts of identity are motifs in the novels by the Korean writer, Chang-rae Lee. Despite having lived an all-American life, Lee admits to feeling the same way as his characters, that is, feeling out of place. "Maybe it's being an immigrant," he remarks. 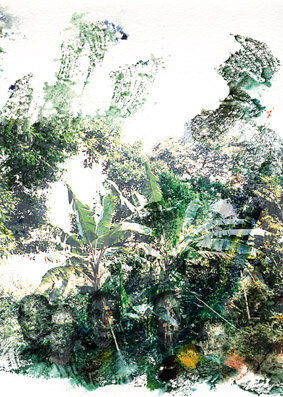 "You inhabit a place, but some part of you is always observing and self-conscious" (Internet). Salman Rushdie, author of Satanic Verses and East, West, similarly writes of the immigrant experience. He compares the experience to a heart that, roped by two different loves, is pulled both East and West, like a couple of horses "whinnying and rearing" (East, West, 209). As an immigrant, the narrator in East, West bemoans the absence of home. 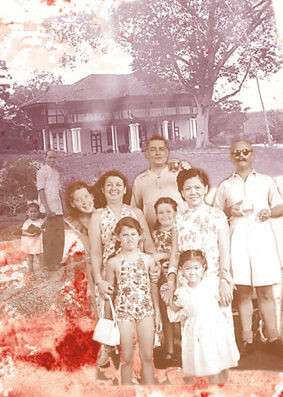 "Home has become such a scattered, damaged various concept in our present travails. There is so much to yearn for. There are so few rainbows any more (East, West, 93). 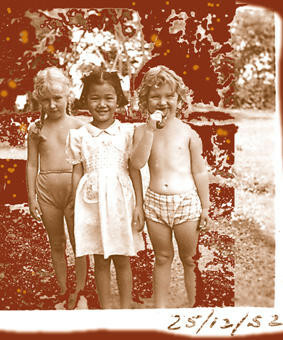 Gish Jen, on the other hand, is a Chinese American writer who grew up in Scarsdale, New York. Of all these writers, Jen is the most pragmatic. Growing up, she was the target of racial oppression and accepted the need felt both by herself and her family to assimilate and fit in. In conversations with her readers, Jen makes the point that ethnicity is a very complicated thing. It is neither stable nor unified. On the topic of what it means to be Chinese-American, Jen remarks that all the groups in America have rubbed off onto each other, and no one group is pure. "If you look at what it means to be Chinese-American today," she says, "I think you'll find that a lot of our ideas about group identity have been borrowed from other groups, including Jewish and Black people. To imagine that being just one thing is the be-all and end-all truth about yourself is naive" (Internet). There is a lot of common sense in this statement which applies to many societies in the Western world that are becoming increasingly multicultural. The truth behind Jen's statement applies to the various ethnicities living cheek-to-jowl not only in the United States but also in Canada, Australia and New Zealand. Where New Zealand is concerned, let me conclude by quoting from a book written by Manying Ip. Manying is a historian who has researched the Chinese experience in New Zealand and has concluded that it is possible to become a New Zealander without totally leaving behind one's cultural identity based on ethnicity. Where the Chinese New Zealanders are concerned, she speaks of a new identity that is emerging, reflecting neither traditional China nor the New Zealand monoculture. This "new identity is based on ethnic awareness and a true understanding of the principal two different mental and physical landscapes in which one moves" (Dragons on the Long White Cloud, 162). And I quote, "This is how we are shaping our new identity. This is how we are reclaiming our heritage and also partaking in the best of both worlds. By acknowledging the past, by accepting the realities of the present, we can map out our future" (Ibid). This, it seems to me, is good advice for all of us who, regardless of where we come from, plan to map out our future here.